Personalized Engraved Garden Stones Custom engraved stones and rocks at SerenityHealth. Many sizes and fonts to choose from. Dame's Rocket, pictured here against a backdrop of tall Bachelor's Buttons, is a delightful upright biennial that is often mistaken for taller varieties of phlox. If in doubt, Dame's Rocket has four flower petals, and all Phlox types have five. Dame's Rocket is an easy to grow biennial or short-lived perennial which naturalizes freely and in some areas is considered a noxious weed. In the home garden, however, this plant can be a welcome addition, providing bright color in the form of white, pinkish purple, or violet purple flowers, on tall, sturdy plants that hold up to all but the strongest winds. It forms a clump in the first year, then bursts into bloom in the second, making the wait very worthwhile. One must get close to it during the day to find the fragrance, but at night it releases a delicious scent into the air that can be detected from a good distance. Bees and butterflies love the sweet smell and bright color of the plant, making it a wonderful addition to habitat type situations. 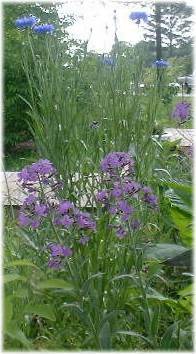 Dame's Rocket does well in seemingly any soil type, explaining it's success in escaping backyard cultivation, but does prefer somewhat moist conditions. It is a mainstay in many perennial and wildflower seed mixes. See seedling identification photo below. It prefers full sun, and blooms mid-spring to early summer. It self seeds freely, but the seed germinates rather sporadically, though once you have grown a few plants you are almost sure to see them again in the future if you have halfway decent conditions. The blooms make excellent and fragrant cut flowers and the plant and flowers are edible, but fairly bitter. The plant is part of the mustard family, which also includes radishes, broccoli, cabbage, cauliflower, and, of course, mustard, to name a few.